(TULSA, Okla.) – Hundreds gathered yesterday for the Muscogee (Creek) Nation ground breaking event for the River Spirit Casino Phase II expansion project in Tulsa, Oklahoma. 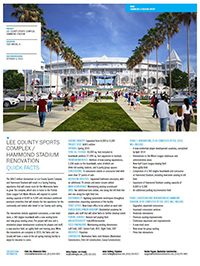 Manhattan Construction Company, a top 5 nationally ranked entertainment/casino contractor by Engineering News-Record, is managing the construction of the project in a partnership with RedStone Construction Services, called Manhattan | Redstone A Joint Venture. 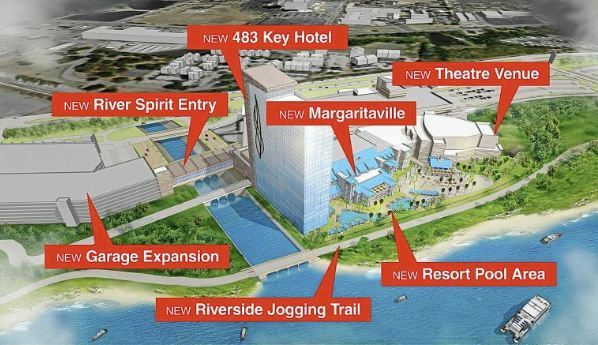 The project will include a 26-story, 483-room luxury hotel, upscale spa, a showroom theatre and several new restaurants, including Jimmy Buffet’s “Margaritaville” Restaurant and Casino and the “5 o’Clock Somewhere” bar. When the expansion is complete, the economic impact is an estimated $135 million annually according to Bob Ball, economist at the Tulsa Regional Chamber. 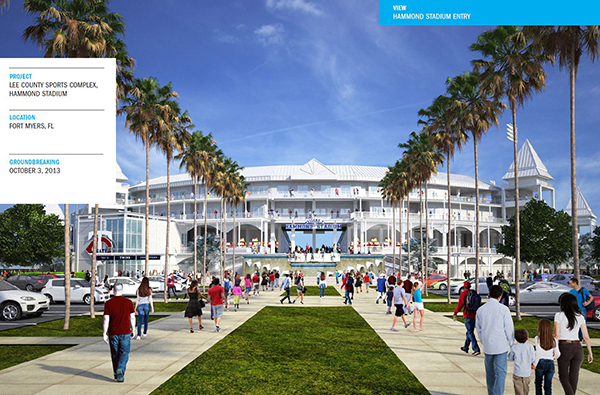 The development will also include a special events venue offering 30,000 square feet of convention and meeting space including a grand ballroom. It will also offer state-of-the-art audio and video capabilities. 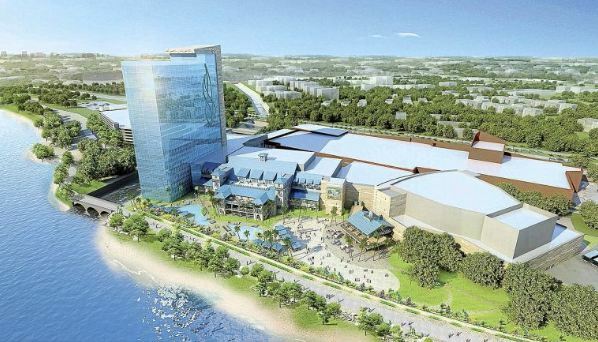 According to the Chief Executive Officer of Muscogee (Creek) Nation Casinos Pat Crofts, the expansion is projected to take 18 to 24 months to complete. Dallas-based architecture firm HKS is the project’s architect. Please join us in congratulating Manhattan Construction Company Project Manager Andrea Gossard for being named a 2013 okcBIZ ‘Forty Under 40’ class honoree. Andrea was selected by a panel of local Oklahoma City area executives who chose the winners from more than 150 nominations. 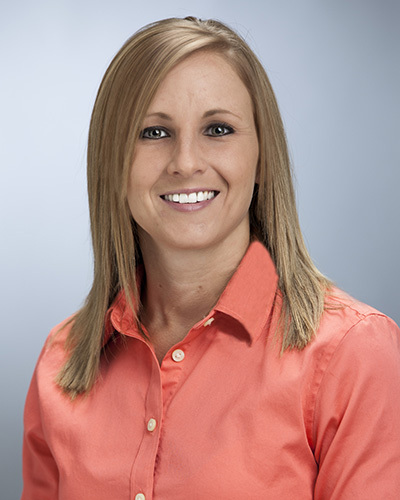 Andrea graduated with a construction management degree from the University of Oklahoma. During her seven-year career at Manhattan, Andrea has been involved with constructing more than $150 million in projects. She has served on teams whose work resulted in multiple quality and safety honors including, three Associated Builders and Contractors of Oklahoma Excellence in Construction Awards (2013, 2012 and 2006) and two Associated General Contractors Build Oklahoma Awards (both in 2012). ‘‘Forty Under 40 extols the achievements and community involvement these young people demonstrate while exhibiting work/life balance,” said Jeffri-Lynn Dyer, okcBIZ publisher. Click here to view her profile on the okcBIZ website. Andrea was honored at an awards event on September 26th, 2013 at IAO Gallery in downtown Oklahoma City. At the banquet she was presented with a $5,000 scholarship from Oklahoma City University’s Meinders School of Business. 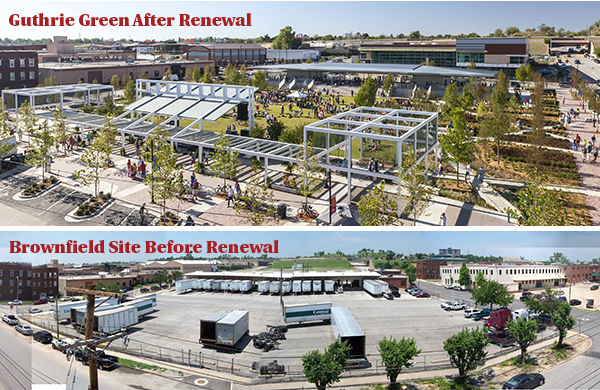 TULSA, Okla. – Brownfield Renewal magazine recently awarded the 2013 Brownfield Renewal Award for Brownfields for Energy to Guthrie Green in Tulsa. The award honors projects that represent the gold standard of brownfield redevelopment across three distinct industry spheres of influence, including environmental impacts, economic impacts and social impacts. The Guthrie Green project includes the transformation of a 2.7 acre brownfield into a dynamic green community park with gardens, interactive fountains, an outdoor stage with vine-covered “green rooms,” a multi-purpose lawn for performances and festivals and a café pavilion. Located in Tulsa’s historic Brady Arts District, Guthrie Green delivers special events, activities and music that showcase a diverse combination of local, regional and national acts. The site was previously the home to a variety of industrial and commercial uses including Vinson Supply, DX, and, most recently, Central Freight. One of the more innovative and “green” uses of Guthrie Green hides just below the park’s surface. Guthrie Green utilizes an innovative ground source heat pump energy system that includes 120 wells drilled to 500-foot depths. These wells take advantage of the constant year-round temperature of about 50 F that is just a few feet below the ground’s surface. The wells provide 600 tons of heating and cooling, which is distributed via underground pipes to the neighboring Tulsa Paper Company building and the Hardesty Visual Arts Center, reducing their heating and cooling costs by approximately 60 percent. The geothermal field was developed with a $2.5 million American Recovery and Reinvestment Act (ARRA) Energy Demand Reduction grant and a $200,000 Oklahoma Department of Environmental Quality Brownfield Development grant. 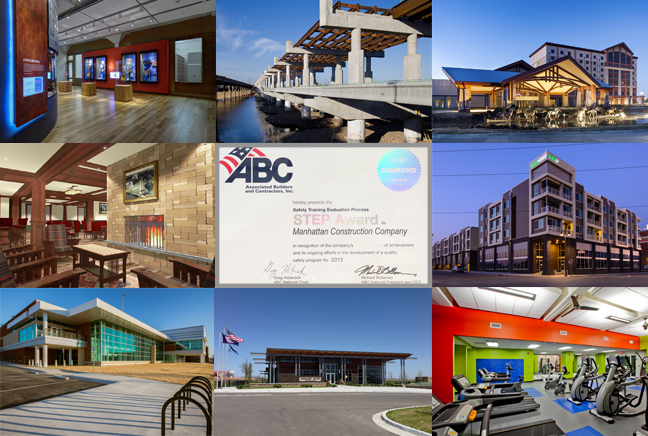 To learn more about the 2013 Brownfield Renewal Awards winners, visit http://www.brownfieldrenewal.com/pr2013.php#nominees. The Guthrie Green project includes the transformation of a 2.7 acre brownfield* into a dynamic green community park with gardens, interactive fountains, an outdoor stage with vine covered “green rooms,” a multi-purpose lawn for performances and festivals and a café pavilion. The project team returned an existing, unsafe and contaminated downtown eye sore at 11 E. Brady Street in Tulsa, Oklahoma into a vibrant urban get away that is also a showcase of “green” technology. A brownfield is land previously used for industrial purposes or some commercial uses. The land may be contaminated by low concentrations of hazardous waste or pollution, and has the potential to be reused once it is cleaned up. Prior to construction there were two rusting fuel tanks identified for removal. During construction a total of 12 rusting tanks were discovered. total petroleum hydrocarbon (TPH) contamination. 90 cubic yards of TPH impacted soil was removed and disposed. 95 tons of contaminated tank fill sand was removed and disposed. Total remediation cost was approximately $170,000.00. 120 wells grouped in 15 circuits drilled approximately 500 feet deep. Crews spent 45 working days for excavation and core drilling for the wells. System provides 600 tons of heating and cooling, which is distributed via underground pipes, to the buildings they serve. Projected energy savings is approximately 60% than a traditional system. All lighting on the site is LED, reducing the overall site demand for electricity. clean the water before it enters the storm sewer. The combined total of private and public funds covered the project cost of $12,580,000. The mission of the Oklahoma Department of Environmental Quality is to enhance the quality of life in Oklahoma and protect the health of its citizens by protecting, preserving and restoring the water, land and air of the state, thus fostering a clean, attractive, healthy, prosperous and sustainable environment. For more information, please visit www.deq.state.ok.us. 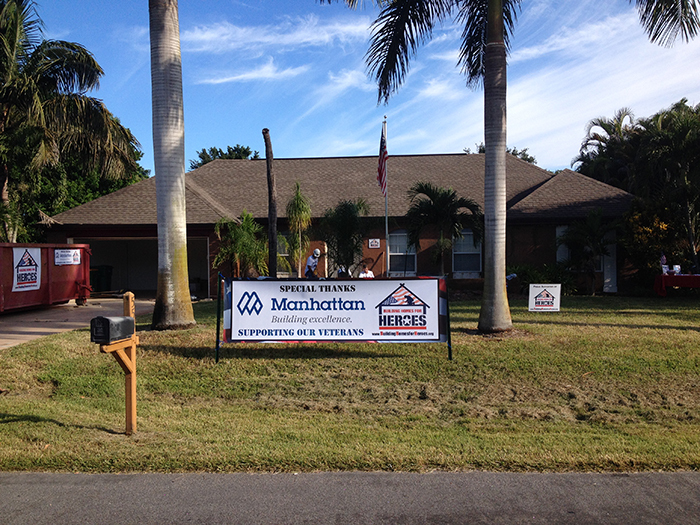 You are currently browsing the Manhattan Construction Group blog archives for October, 2013.